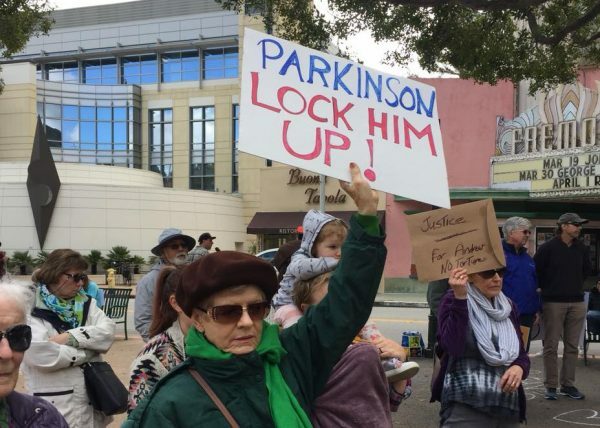 Dozens of protesters gathered Saturday afternoon outside the San Luis Obispo courthouse seeking the resignation of Sheriff Ian Parkinson and District Attorney Dan Dow. The rally follows the release of a video that confirmed earlier CalCoastNews reports regarding the death of Andrew Holland. For years, the sheriff’s department has violated California laws regarding the treatment of mentally ill inmates, according to state reports. After Holland began harming himself, deputies strapped him naked in a restraint chair where Holland remained for 46 hours. Holland died shortly after deputies released him from the chair and dumped him on the cement floor of the drunk tank, from a blood clot that traveled from his leg to his lung. Following Holland’s death, in an apparent coverup, the the sheriff’s department disbursed false information including that Holland likely died of respiratory arrest, that Holland was continually under a physicians care, that his department followed state laws regarding the treatment of the mentally ill and that medical staff had ordered that Holland remain in the chair. 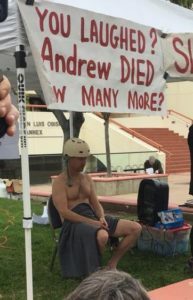 As part of the ongoing protest, the SLO Progressives plan to have volunteers sit in a chair with a helmet for 46 hours to symbolize the last days of Holland’s life. The protesters are asking attendees to sign a petition demanding Parkinson step down. San Luis Obispo Mayor Heidi Harmon, who failed for months to comment on civil rights violations at the jail and the death of Holland, which was first reported by CCN more than a year ago, appeared to chastise other elected officials for not attending the rally sponsored by a political group she co-founded, the SLO County Progressives. Harmon also voiced fears for her safety because of her attendance at the rally. Last summer, Harmon sought police protection after a gay pride flag that was hanging on the roof of her porch was stolen, placed in the gutter and torched. Bruce Gibson. Unbelievable. I just saw what he wrote on his Facebook page, here it is: “To me, acknowledging our failure is fundamental to changing the way we treat mentally ill inmates. The changes we make to a policy and procedures manual have little chance of effecting lasting improvement if they aren’t accompanied by a profound change in the culture of indifference that was part of this devastating event. The first step of our recovery is admitting the problem. Really Bruce??? You have been in office for 12 years. You oversaw and helped CREATE this culture! And now you are talking about changing it? Bruce Gibson is so entrenched he can no longer discern right from wrong. Oh… now it makes sense. I was just informed that Bruce received a $3500 check from the Holland Family as a campaign contribution. Wow. Something stinks here. Thank you DocT for telling the truth.